A few weeks back, a colleague brought in this cake for the staff that was absolutely delicious. I am a chocolate lover through and through and I when presented with an array of dainties or desserts, 90% of the time, I’ll choose a chocolate option. Of course, I love a variety of desserts, but generally speaking I’ll go for something chocolate. So, for me to say this, is a huge thing…..according to my taste buds this is one of the most delicious cakes I have ever tasted. It is very rich and the combination of flavours is really fabulous. I am not actually going to post this recipe, only because I followed it exactly as Alex Hitz instructed in his post on House Beautiful. To check-out this incredible recipe for Salted Caramel Cake, follow the link. I placed some whipping cream in a disposable icing bag and piped it around the edges and in the center. The finished cake was a whopping 6″ tall. I decided to make a batch of candied pecans for the top. Mmmm. I was a bit concerned that Shay might not like the cake, so I used some left over cake from his kid’s party to make some chocolate cake pops…just in case. He loved the cake and the cake pops too! I won’t lie, this is absolutely the most fattening sugar laden concoction you’ll ever taste, but man is it worth it! The recipe suggests that it serves approximately 16, but I think you could easily serve more. I served 12 pieces of cake at the party and still have exactly one half of the cake left. I cut the pieces quite small as it is very rich and only a few had seconds. You could easily serve 20 with this cake. Bake the cake the day before, cool it completely, cover and leave on the counter for frosting the next day. The recipe suggests putting the caramel mixture in the freezer to cool for about 40 minutes. I think mine took about an hour and a half before it was completely cooled. The bottom of my pot was still hot to touch after 40 minutes in the freezer. Do a crumb coat and then pop the cake in the freezer for about an hour or longer. A crumb coat is a thin layer of icing that covers the outside of the cake and catches all of the crumbs. This recipe makes a gargantuan amount of frosting which is fabulous. There is nothing worse than doing a 6 layer cake and running short on frosting. There is plenty of frosting to do a crumb coat, freeze and then do a final beautiful layer of frosting. I covered the remaining frosting and popped it in the fridge while the cake with the crumb coat was in the freezer. I’m not saying this was a mistake, but perhaps it wasn’t as smooth and creamy as it was before placing it in the fridge. I thought it would hold its shape a bit better as it was very creamy and I wondered if it might slide down the sides if left out. You can decide. When I went to bake my cakes, I realized that I needed 3 pans. I have four, but they are 2 sets of 2 and the sizes weren’t exactly the same. I ended up calling my neighbour and lucky for me they had just purchased a set of three new cake pans, so I just used there set of three. At the time, I didn’t realize it, but I think they inadvertently saved me a huge mess and intense frustration. (Thanks Kelli and Ian!) I should know better, but I had a printed out version of the recipe from my friend and didn’t bother to read the reviews prior to making the cakes. I usually check out the reviews prior to making a recipe, as there are often good tips. Before posting this, I decided to see what others had to say and sure enough there was a theme in the reviews. Everyone loved the cake, but many had an issue with their cake batter spilling over into the oven and having to toss the cakes out . Yikes! The pans that I generally use were my moms and can be seen below on the left. They are not very deep and I can see how I would have had the same problem had I used those pans. Instead, I used pans similar to that on the right. Moral of the story….use deep pans! 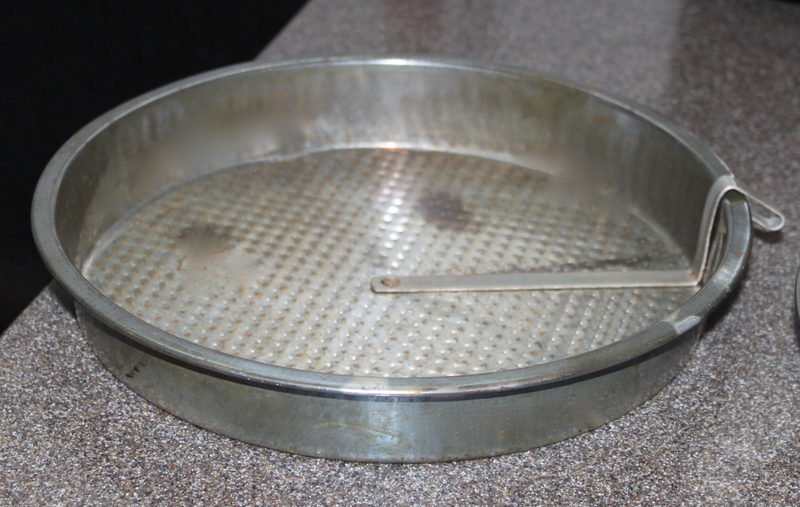 More about the pans….I have never baked in deep pans like this and I instantly loved them. Not only did the cake not spill over, but instead of the baked cake having a huge dome on top where it rises during baking, the cake remained relatively flat across the top. At first, I was concerned that they weren’t rising, but then it hit me. In my shallow pans, the cake is forced to rise in the center because the sides are not tall enough to support the rising cake. In the deeper pans (about 3″, I think), the entire cake rises and the result is a more even surface. This is especially important when layering cakes as the stacked cakes are much more stable with a more even surface. I loved these pans and thought I might buy a set, but my neighbour insisted I just borrow theirs whenever needed. Love that idea even more as I don’t have to spend the money or store the suckers. Too bad they don’t nestle together like my old ones. I placed three wooden skewers through the layers of the cake prior to my final coat of icing. I just find that it prevents any sliding when cutting the cake. 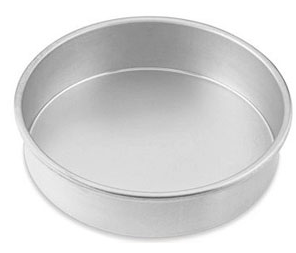 Old 9″ pan with slider to help remove cake. Only about 1 1/4″ high. The 9″ pans I used. This cake is a must try! It is absolutely worth the extra effort. I can’t say that it would be a cake I would make regularly as it is more work, more expensive and off the scale in terms of naughty, but it is the perfect cake to serve a large group and will definitely impress those with a sweet tooth. Enjoy! Posted on June 14, 2014 by Cindy Roy •	This entry was posted in Cakes and Desserts, Recipes and tagged baking tips, Delicious Caramel Frosting, homemade birthday cake, how to bake a cake with an even surface, Salted Caramel Cake. Bookmark the permalink.